Car shows offer attendees the chance to enjoy a slice of Americana in an enjoyable, family-friendly environment. 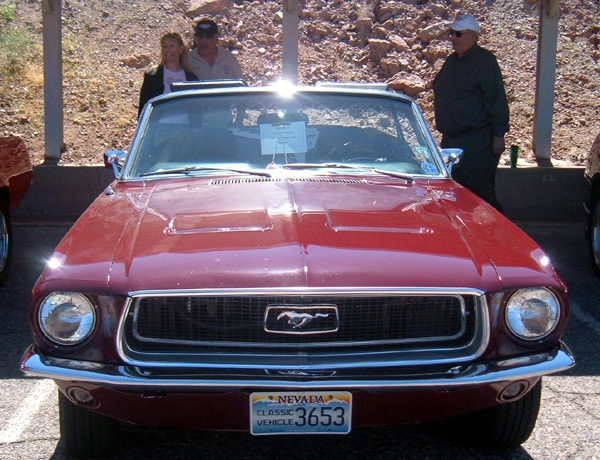 As the proud owner of a 2006 Mustang GT (the retro motif got me), I jumped at the chance to check out the Mustang and Classic Ford Club of Las Vegas‘ recent “Dam Show,” held at the Hoover Dam on Saturday, April 4. The weather was crisp and the sky a perfect blue as I cruised down U.S. Highway 93, slowed for the serpentine descent to the dam and the Arizona state line, and entered Lot 9. The view was remarkable. 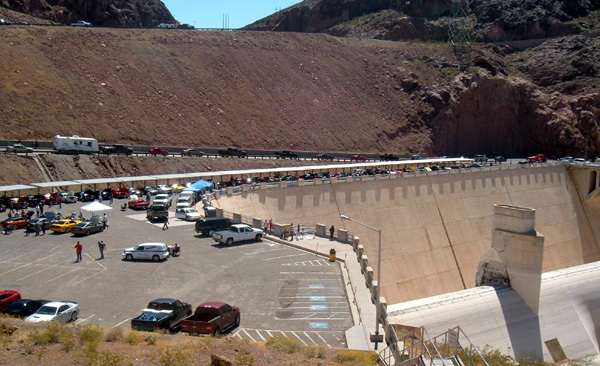 On the right were approximately 65 vehicles, including 60 or so Mustangs (the event was open to all cars); on the left was the dam, its concrete, electrical wires and housings flanked by the Nevada and Arizona hills. As I walked the row of “pony cars” (the ’64 Ford Mustang was the first of the kind – hence the “pony” name to describe similar cars, including GM and Chrysler offerings), I met a friendly Rhode Islander and ex-Navy career man named Fred Blair. 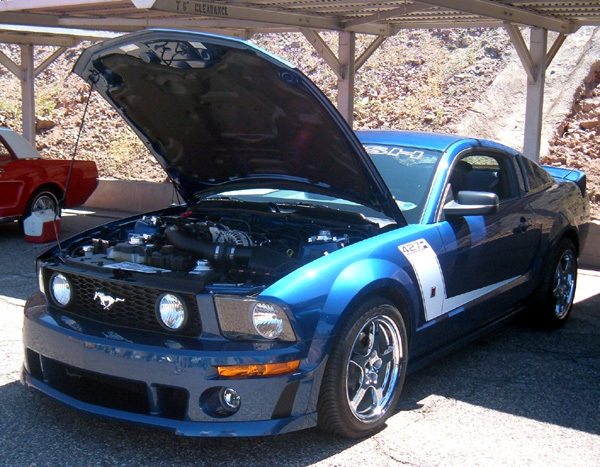 He was showing a blue, 435-horsepower Roush-enhanced ’05 GT (see photo). I enjoyed the chance to talk about Mustang-related issues with someone who really cared about them. Blair offered helpful advice about replacing my car’s sloppy factory gearbox and remarked on the night-and-day quality improvement of the current-generation Mustang over his 1992 model. Fortune was smiling on Blair, as he had a drive to Alabama on his agenda (for another show) soon after the event. I then met Paul Robillard, a construction worker from my native Boston. He’d been laid off from the City Center project the day before the show, and said more cuts were imminent, but his enthusiasm for the cars was undiminished. Blair, Robillard and I assessed a ’65 coupe for sale and pronounced it “OK, nothing special” when asked for our opinion by a woman who said she’d wanted a ’65 Mustang since she was a little girl. Hopefully not that one, at least not without a substantial reduction in asking price; the vehicle had numerous flaws, including obvious body fill. As I resumed my wanderings, I saw several variants of a classic scene: a father telling a wide-eyed child about the cars as they walked hand in hand. Buoyed by the show’s location at a major tourist attraction, the cars also attracted a large international contingent: I heard Russian, French, Japanese and another lingo I didn’t recognize spoken by a family of turban-clad gentlemen. People mingled, relaxed by their cars and strolled the lineup. It was a serene scene. Refreshments were available. 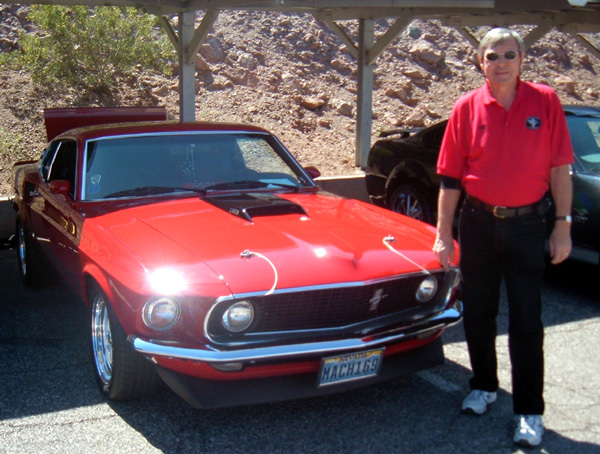 My favorite of all the cars was a 1969 Mustang owned by a man named Jeff Doak (see picture); to my surprise, there were only two examples of the classic ’69 and ’70 models at the show. Doak took me through the car’s history – born in San Jose, sold in Vegas – and voiced an opinion that I share when he declared that with the ’69 and ’70 Mustangs, Ford “got it exactly right.” Jeff bought his first ’69 in ’69, his second in ’89, and his current version in 1997. Another attendee brought the other ’69 model down to the show. It’s his dad’s car, and it was for sale. Despite having a highly desirable 428 engine, the car failed to attract the minimum bid at a recent auction – another sign of hard economic times. Club president Larry Garreffa was a gracious host. The Chicago native took me through the restoration of the ’68 convertible he was showing (see picture); somehow he had transformed a clump of vaguely car-like materials into the burgundy beauty I saw on display. He mentioned that the club holds periodic road trip events, and pointed me toward a raffle of Mustang hats and other items, a benefit for a good cause – Meals on Wheels (the wheels are probably not Mustangs, which I know from experience lack meal-carrying capacity). Everyone else was friendly, too, and I fielded many offers for a free sack lunch as I left. Even if you’re not a car person, these shows offer a low-cost opportunity to learn about a uniquely American phenomenon, meet salt-of-the-earth folks, and even contribute to a good cause. There are clubs for many makes and models, so if the Mustang isn’t your ride, just Google your preferred vehicle and get out to a show. Sounds like a cool event — thanks for this story — Maybe you’ll have to post photos of your own ‘Stang ride when we get author blogs operational….